Perth is the coastal capital of Western Australia. On this co-sponsored, direct enrollment semester program, students take courses alongside Australian and other international students at the University of Western Australia (UWA). UWA is one of the top eight research institutions in Australia and offers a wide variety of course options. Course Equivalencies: Please see the Perth course equivalency list for program enrollment requirements and a list of IU course equivalencies that students have received in the past. Housing is not arranged by Overseas Study. Students must apply independently for housing in Perth, just as Australian students do. Students interested in living on-campus in a residential college should apply for this option, even before they are accepted to the program. Please visit the University of Western Australia's Accommodation Service for details about living on-campus. Overseas Study encourages students to apply for more than one residential college simultaneously as there is limited space available. Some residential colleges will require an application fee and an extensive application. If there is no availability in the residential colleges, students will need to consider other housing options such as living off-campus in independent apartments. All students are eligible to apply for temporary accommodation during the first few weeks in Perth while they search for other housing options. If you have questions, please contact Overseas Study. Biology majors need to have completed L111, L112 and L113 (or an upper-level lab) prior to participation in the program. * Fee based on published UWA materials. Indiana University cannot guarantee the prices charged by UWA. Fee estimated based on current exchange rate and will be re-evaluated in late June to see if the rate of exchange has changed significantly. Fee could be increased or decreased based on the rate at that time. Airfare, personal expenses and vacation travel additional. Initial prepayment of $500 due March 19, 2019. Airfare, personal expenses and vacation travel additional. Initial prepayment of $500 due October 29, 2018. 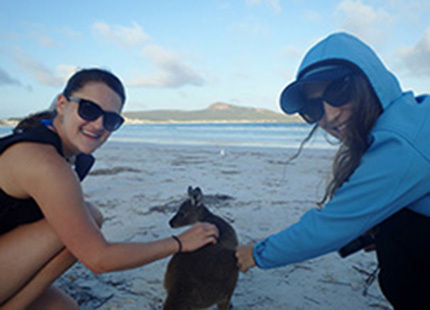 Read the IU Overseas Study handbook for semester programs in Australia.